More frequent burning can reduce soil carbon and fertility, slowing the regrowth of plants. Fires burn >550 million hectares across the globe every year, on average, having pervasive effects on ecosystems. The influential paper “The global distribution of ecosystems in a world without fire1,” posited what the biomes of the world would look like if fire was removed. The answer was an obvious one: dramatically different. 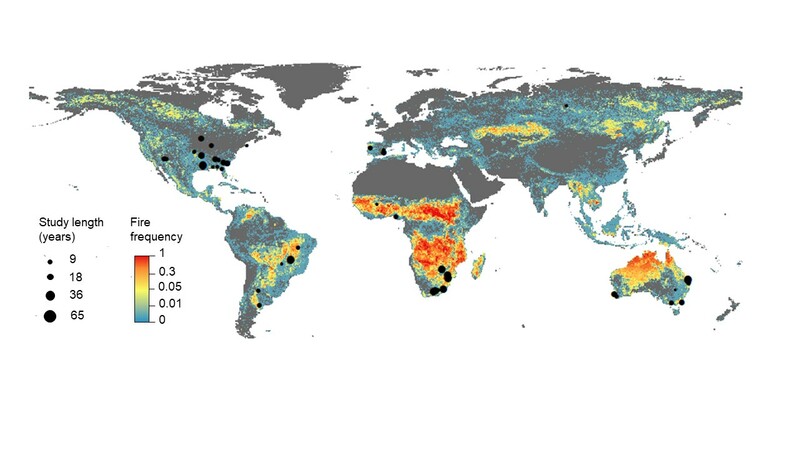 Although this may have been an obvious answer, the analysis was greatly needed, because it illustrated the global influence of fire on a myriad of ecosystems. However, this analysis, along with many others, took an aboveground perspective, focusing on the response of plants. The response of plants is indeed a dramatic picture, one can imagine a picture of charred plant biomass, scorched tree trunks, and blankets of ash. However, our mental image becomes murky when we try to imagine the response of what is belowground: the soil. This is a critical uncertainty because soils are a dominant carbon storage pool in many ecosystems, and are critical for the cycling of nutrients needed for plant growth. Motivated by the uncertainty in soil responses, we set out to understand how fires influence the soil from a perspective that considers the long-term effects of repeated burning. In a year without fire, as aboveground biomass dies and leaf litter decomposes, it releases carbon and nutrients back into the soils. But in a year with a fire, the litter and plant biomass are combusted, leaving little plant mass to decompose into the soil. Over multiple years and repeated burning, lower inputs into soils potentially result in soils having less and less carbon and nutrients; however, evaluation of this theory was primarily restricted to case studies that focus on specific regions or ecosystems, limiting insight into generalities. To address this issue, we compiled a dataset of sites that had experienced decadal changes in fire frequencies, which included a synthesis of data from the literature, as well as original sampling performed by our team to help fill in data gaps. Our own sampling efforts took us to sites in Africa, South America, and North America. Within each site, there were plots that experienced high fire frequencies paired with adjacent plots that were protected from fire for 9-65 years. The “paired comparison” allowed us to evaluate the effect of fire within each location, and then compare the effects across sites to evaluate generalities in how fire alters soils. Figure depicts fire frequency taken from GFED4s (accessed from http://www.globalfiredata.org/data.html) with the distribution of our sites. We show that fire has pervasive effects on soil carbon and nutrients, but whether frequent burning enriches or depletes carbon and nutrients depends on the chemical properties of elements, plant community composition, and the length of time plots have experienced altered fire frequencies. Soil carbon and nitrogen, an essential nutrient limiting plant growth, decrease in savannas, grasslands, and broadleaf forests but only after multiple decades of different burning frequencies. We complemented our empirical study with vegetation model simulations to evaluate the impact of soil nitrogen losses on ecosystem productivity. Simulations suggest the persistent nitrogen losses may be a key pathway suppressing the ability of ecosystems to regain the carbon emitted during a fire. This study provides a framework for further evaluation of multiple vegetation models, and the necessary dataset for such validations. Whether we are on a trajectory towards a world without fire vs. a world with accelerating fire activity depends on both the location, and the climate and land use projections. However, regardless of the sign of the trajectory, persistent shifts in fire will influence biogeochemical cycles in ways that involve both plants and soils, requiring us to consider the interactions and feedbacks that emerge between both systems. Cover photo caption: Repeated fires in savannas, which are dominated by grasses, can reduce carbon and nitrogen in soils for decades. The reduction in nutrients can lead to poor plant regrowth. Credit: Carla Staver. 1. Bond, W. J., Woodward, F. I. & Midgley, G. F. The global distribution of ecosystems in a world without fire. New Phytol. 165, 525–538 (2005).